... just not sure what it is. I think its a demonstration on how to properly anchor your boat. 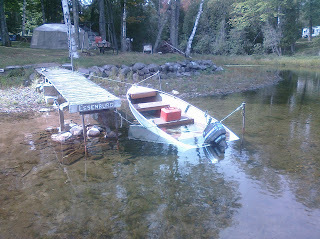 Too bad we do not have enough water at our dock to try this technique. I really do think that rocks make a better retaining wall then logs and dirt. I would have to agree with that. Uncle mike you should canoe out to the island and get some big rocks to start a rock retaining wall at the end of our new beach front. You build a wall with the workers you have, not the workers you wish you have. Frankly, I am surprised it turned out as well as it did. I think it was more a failure of leadership. There was no expectation of anything better. We were instructed to build with logs and dirt. Spoken like a union organizer.